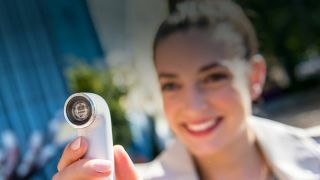 HTC Re, the portable camera that looks more like a handheld periscope, has its sights on the rugged and reliable GoPro Hero 3 and GoPro Hero 4 line. The idea behind this easy-to-use action camera is that you're no longer forced to peer through a smartphone viewfinder when capturing life's best moments. Instead, it's all about getting lost in the moment. Not everyone is sold, but that's enough for me to want to buy into the HTC Re's one-handed operation and custom 146 degree wide angle lens. I like the promise of unshackling myself from the viewfinder while still allowing me to walk away with photos and video, even if I don't like the $200 (likely north of £150, AU$226) price. As someone who owns and still uses Google Glass, I know a thing or two about obtrusive camera technology. I often limit my public Glass use to tech events where people want to demo it. HTC Re, however, is subtle compared to Google's face-worn wearable and less of a nuisance next to a smartphone. Sure, it could spark curious questions, but without a viewfinder, there's no chance for playback on this small, lightweight device. That means no more incessant nitpicking and retakes from friends. The grip-and-go design of the HTC Re makes it an ideal action camera. It's perfectly marketed toward everyday selfie takers and vloggers. There are just two buttons. The button in the back takes photos and video. A short press snaps 16 megapixel photos. A long press starts the 1080p video recording. The front button triggers slow motion video capture. What's missing are the cumbersome menus that often weigh down the time and therefore enjoyment of life's most precious moments. If they're important enough to capture, they're too important to fiddle with manual controls for over a minute. HTC Re uses low power sensors to turn on when it's picked up. That means it's supposed to be always ready when you need it. You won't find a power button on this camera for that reason. It relies on a 820mAh battery. That makes the battery life good enough for 1,200 photos and 100 minutes of video. It's a large enough battery to fill up the 8GB micro SD memory card that the HTC Re comes with, but it'll need a few recharges before maxing out the 128GB micro SD cards it supports. Hyperlapse and iOS 8's camera have proven that time lapse video can be fun to create. It's just not always convenient to capture that sped up video with your all-important phone, HTC pointed out at its press conference. Offload that job to the HTC Re. A micro USB charger or battery extender stick can be attached to make the timelapse last longer. To perfect those timelapse videos, Re is compatible with standard camera tripod mounts and HTC's own line of stick mounting accessories. There's a bar mount with an adjustable clamp for handlebars, whether you're on a motorcycle, bike, scooter or (I'm on a) boat. A clip-on accessory turns HTC Re into a wearable with a rotating swivel design. It can be attach to seat belts, shirt collars, backpacks, etc. A suction mount is useful for car windows while the head mount is meant to give GoPro a run for its extreme sports money. Any endurance activities that need to be filmed will also need the extended battery pack in the matching shape of a stick.